Mythological stories such as Homer’s Odyssey were popular in film from the turn of the century until the late 1910s. (7) Reviews of the time emphasise both the cultural integrity and visual appeal of the high-budget adaptations. The silent adaptations of myth drew heavily on the attractions tradition, with a focus on the spectacle of the cinematic medium and special effects. In the transition to narrative films, mythological stories provided a context for these spectacular displays. Homer’s Odyssey depicts mythological creatures such as the Cyclops Polyphemus, and uses trick photography to depict the goddess Minerva appearing and disappearing out of thin air. Mythological epics such as The Odyssey also afforded the opportunity for battle scenes, large casts and exotic locations. Thus, while Bush’s review stresses the “classic” source of Homer’s Odyssey and “the genius of Homer”, he also praises the scenery and special effects as “a delight to the eye” (8). In its advertising advice column, The Moving Picture World acknowledged that potential customers will be drawn in primarily by “the adventures in the Cyclops’ cave […] the allurements of the sirens, the escape past the dragons” (9). 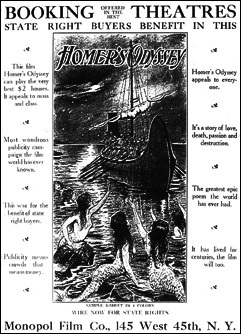 Both the reviews and the advertising of Homer’s Odyssey suggest an attempt to balance an appeal to the “classic” status of the original text with the promotion of spectacle. Sobchack argues that the epic lost its “expansiveness” when it was transferred to television in the mini-series format, reduced to a small screen, lower budgets, and the temporal fragmentation caused by advertisements and the mini-series format itself. (10) Although unable to match the scale of cinematic epics, the mini-series usually enjoyed a higher budget and longer episode duration than other television programs. Earlier attempts to bring myth to U.S. television included one-off specials and children’s programs in the 1950s and ’60s, which tried to harness the popularity of the epic within the limitations of television as a small-screen domestic medium. Relative to these early television shows, the mini-series was in fact an expansion of scale. Thus, when an Italian mini-series production of The Odyssey (Franco Rossi, 1968) was imported to U.S. television, it was reviewed in terms similar to its silent film forebear. Variety emphasised that it was “the costliest venture in Italy to date” (11) and the program was commended for “adapting one of the oldest literary masterpieces” (12). Here, then, The Odyssey is described in terms of “epic”, “classic” and “legend”, while simultaneously being applauded for its spectacle. This duality between the “dignity” of an old story and its visual appeal could be found in reviews of cinema renditions of myth as far back as the silent era, as seen in the case of de Liguoro’s Homer’s Odyssey. De Liguoro’s film of 1912, and The Odyssey mini-series television program of 1968, were received in remarkably similar terms, revealing a degree of continuity in the association of myth with cultural status but also with modes of display. The association of the epic with spectacle and an excess of physical and temporal scale explains why little work has been done on television’s earlier attempts to adapt the epic. Due to the literal smallness of the screen, the lack of lush colour, the small number of programs dealing with comparable subject matter and the brevity of program duration, early television seems to have little that is ‘epic’ about it. (14) Rick Altman has pointed out that contemporary sources can reveal different genre groupings to those retrospectively assigned by scholars. (15) Thus, reviews of U.S. television programs from the ’50s and ’60s recognised alignments between adaptations of myth across different media. Indeed, Jay David Bolter and Richard Grusin argue that adaptations from one medium to another always leave a trace of the original medium, and the resulting text may highlight or attempt to hide the adaptation. (16) In its adaptation of mythological material, television turned not only to ancient epics and plays, but also the more recent adaptations of those materials in cinema and other media. Programs used mythological material to suggest the cultural possibilities of the television medium, much as had occurred in the case of early cinema. 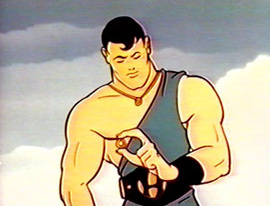 One episode cast its young guest hero in the role of Hercules. (25) Mr. I. Magination was so popular it became the first television show to return to the air as a result of audience protests against its initial axing in 1951. (26) While such programs constituted a relatively small portion of television’s output, the adaptation of myth in early television has alignments with the use of mythological subjects in early cinema, as a means of lending authority and acceptability to a new medium. This Variety review merits a breakdown of terms. By calling the production “DeMillean”, the reviewer makes an explicit link with the cinematic tradition of films set in the ancient world, with Cecil B. DeMille directing films such as The Ten Commandments (1923), The King of Kings (1927), The Sign of the Cross (1932), Cleopatra (1934) and Samson and Delilah (1949). (30) The review commends the program as “impressive as a spectacle”, yet this receives what must be considered a television-specific qualification: the spectacle is achieved through “the illusion of magnitude” rather than its actuality. Variety continues to commend the “large cast”, again emphasising the scale of the production. Rather than merely comparing the Homeric epic directly with its television adaptation, Variety understands this textual relationship via the mediation of cinema. While cinema in its cycle of silent epics had looked to earlier media as a way of borrowing cultural legitimacy, by the time of Omnibus cinema had become the reference point for television. By comparing Hercules with the under-funded “soupbones in the genre”, the Variety review sets up a direct comparison with the muscle-man “sword-and-sandal” films in circulation, and Hercules films in particular. The attempt to establish an ongoing television program based on Hercules was evidently aimed at harnessing the popularity of these films with audiences, if not reviewers. The review highlights television’s lack of budget and scale in its treatment of mythological subjects, linking the program with the lower-budget end of the cinema epic resurgence but placing television’s effort at the very bottom of the hierarchy. While U.S. television looked to both cinema epics and ancient mythological epics as sources of cultural authority, it also reworked the epic into new formats more readily achievable on television, taking the epic away from its association with spectacle and excess. This can be seen in the television version of You Are There (1953-1957), an educational children’s program that was presented as a mock news report. (37) Walter Cronkite as anchor would announce the story as news, and cross ‘live’ to events, which were covered by journalists’ interviews and a voice-over narration. (38) In “The Fall of Troy” 1953 episode, the mock journalists provide geo-political background to the Trojan conflict and undertake ‘live’ interviews with key participants, such as Agamemnon. Because it was masquerading as serious news, “The Fall of Troy” did not need to be spectacular. “The Fall of Troy” used black-and-white stock, a restricted number of static sets and a cast too small to depict the final conflict. In treating myth as news, You Are There shifted to focus to interpersonal, political exchange over spectacle, a focus more readily achieved on a television budget. By mimicking television’s journalistic tropes of news and documentary, the educational legitimacy of the program could be stressed in a new way. You Are There still cites Homer’s Iliad as authority for the account, but the television conventions of news provide authority in themselves. (39) “The Fall of Troy” illustrates how children’s programs still adapted myths for their association with educational and cultural value, but moved away from the cinematic focus on spectacle that informed the higher-budget television specials. Like most television adaptations of mythology, You Are There was not set purely in the mytho-historic past, but rather involved time-travel and the melding of myth with contemporary elements. Although an intertitle proclaimed the year to be 1185 B.C. in “The Fall of Troy” episode, Cronkite and his crew nonetheless had 1950s microphones and suits, suggesting that they had been able to travel back in time. Thus, Variety noted that the show “has dared to confront viewers with all the modern physical trappings of newsmen and their mikes and posted these vis-à-vis the great events of history” (40). Similarly, Mr. I. Magination had taken children back in time, or to the world of literature or myth, through his special imaginative powers. In its revised version of the tasks of Hercules, a contemporary vacuum cleaner was used to clean the Augean Stables. (41) Many children’s programs emphasised imaginative engagement with the mytho-historic past. (42) While the adult specials followed the cinematic trend by setting mythological stories in a mytho-historical time-frame, children’s programs displayed greater temporal and genre fluidity. Contemporary reviews reveal that mythological epics were seen as edifying otherwise controversial media, namely early narrative film and early television. Reviews deflected the debate about the worthiness of each new medium onto more established works and media forms. But in the case of television, cinema had itself become an established reference point. Television programs could not compete with the literal scale of screen, cast and set used in cinema depictions of myth, a disparity seemingly more acceptable in children’s programs. In adopting cinematic terms of reference, reviews of television programs based on myth reveal the way that the ‘epic’ as a perceived genre was carried across media yet also reconstructed beyond the cinema. 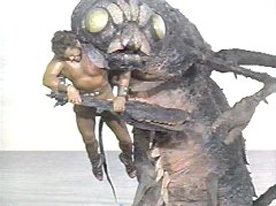 Early U.S. television adapted mythological epics via the mediation of cinematic epics, but also sought television-specific ways of rendering the material that downplayed the cinematic connection. W. Stephen Bush, “Homer’s Odyssey. Three Reels. (Milano Films. )”, The Moving Picture World, Vol. 11, No. 11, 16 March 1912, p. 941. I would like to thank the following bodies for their financial assistance during this research: The School of Art History, Cinema, Classics and Archaeology at the University of Melbourne; The Alma Hansen Scholarship; The M. A. Bartlett Foundation; The University of Melbourne Scholarships Office; and the Faculty of Arts at the University of Melbourne. Academic explanations of myth tend to focus upon subject matter that is supernatural, heroic or concerned with origins, orally composed and transmitted, archaic in setting, and sacred in nature. Alan Dundes (Ed. ), Sacred Narrative: Readings in the Theory of Myth (Berkeley: University of California Press, 1984), pp. 1, 50-1, 64. Elsewhere, I have argued for a more performative, procedural understanding of myth in keeping with the word’s origins in Homer. Djoymi Baker, “Broadcast Space: TV Culture, Myth and Star Trek” (2005), unpublished dissertation. Lowell Edmunds, “Myth in Homer”, in Ian Morris and Barry Powell (Eds), A New Companion to Homer (New York: Brill, 1997), pp. 415-8, 420. However, in most scholarship, and indeed in popular culture, myth functions as a genre label. G. S. Kirk, “On Defining Myths”, Phronesis: A Journal for Ancient Philosophy, supplement to Vol. 1, 1973, pp. 61-9, reproduced in Alan Dundes (Ed. ), Sacred Narrative: Readings in the Theory of Myth (Berkeley: University of California Press, 1984), pp. 53-61. For the purposes of this article, myth is understood as a set of traditional stories. Andrew Ford, “Epic as Genre”, in Ian Morris and Barry Powell (Eds), p. 399. Vivian Sobchack, “‘Surge and Splendor’: A Phenomenology of the Hollywood Historical Epic”, Barry Keith Grant (Ed. ), Film Genre Reader II (Austin: University of Texas Press, 1995), p. 286. Steve Neale points out that scholars tend to focus on the era in which an epic is set, rather than the era in which it was made. Any subgroup of the epic can nonetheless be historicized by examining the way in which it functions or changes in key periods of a given industry. Steve Neale, “Epics and Spectacles”, Genre and Hollywood (London and New York: Routledge, 2000), p. 87. Sobchack, p. 286, emphasis in original. Jon Solomon, The Ancient World in the Cinema (New Haven: Yale UP, 2001), p. 102. Epes Winthrop Sargent, “Advertising for Exhibitors”, The Moving Picture World, Vol. 11, No. 8, 24 February 1912, p. 763. Sobchack, pp. 299, 300. On the mini-series, see also: Solomon, p. 17. N. D. Batra, “The Mini-Series: Epic in the Age of Television”, The Hour of Television: Critical Approaches (Metuchen, NJ: Scarecrow Press, 1987), p. 199. Hank Werba, “Italo TV ‘Odyssey’ Hits a Homer”, in Howard H. Prouty (Ed. ), Variety Television Reviews, Vol. 9, 1966-1969 (New York: Garland, 1989-1991), 22May 1968, no pagination. Indeed, this may be due to the choice of the term ‘epic’ to describe the genre. Jon Solomon does include some television programs in his study, but tellingly he prefers the classification of “ancient” films rather than the epic, which he treats as a subset. Solomon, pp. xviii-xix. See also Maria Wyke, “Film Style and Fascism: Julius Caesar”, Film Studies, Issue 4, Summer 2004, p. 69. Incomplete holdings of early television and the disintegration of early kinescope stock mean that comprehensive examinations of a particular program, time period or genre are often difficult, if not impossible. In part, these archival challenges dictate the terms of reference, shifting attention from the programs themselves to their reception the popular press. Rick Altman, Film/Genre (London: BFI, 1999), pp. 78-9, 82. Jay David Bolter and Richard Grusin, Remediation: Understanding New Media (Cambridge MA: MIT Press, 1999), pp. 44, 47. Although Bolter and Grusin are primarily concerned with new media, they stress that this process of ‘remediation’ has a long history in a variety of different media. Writing in the same year, Louis Reeves Harrison argued that “[t]he best photoplays are already at work educating children”. Louis Reeves Harrison, “The New School”, The Moving Picture World, Vol. 11, No. 12, 23 March 1912, p. 1041. George W. Woolery, Children’s Television: The First Thirty-Five Years, 1946-1981, Part II: Live, Film and Tape Series (Metuchen, N.J.: The Scarecrow Press, 1985), pp. 586-8. As Lynn Spigel has explored, these inquiries were linked to broader concerns with juvenile delinquency that became particularly heightened after World War II. Lynn Spigel, Welcome to the Dreamhouse: Popular Media and Postwar Suburbs (Durham: Duke UP, 2001), pp. 191-5. Of course, such concerns had been raised in relation to radio and even simple oral storytelling, which could prompt “terror” in the evening. E. Evalyn Grumbine, “Reaching Juvenile Markets”, Psychology of Juvenile Appeal (New York: McGraw-Hill, 1938), reproduced in Henry Jenkins (Ed. ), The Children’s Culture Reader (New York: New York University Press, 1998), p. 461. Stuart Fischer, Kids’ TV: the First 25 Years (New York: Facts on File Publications, 1983), p. 4. Jose, “Mr. I. Magination”, in Howard H. Prouty (Ed. ), Variety Television Reviews, Vol. 3, 1923-1950 (New York: Garland, 1989-1991), 6 September 1950, no pagination. When Mr. I. Magination debuted in 1949, Variety similarly argued that “[k]ids, adults and educators alike should go for this new moppet show […] Format permits the inclusion of considerable educational material […] It might not have been the way history teachers would have it, but the facts were correct and the kids should remember the story.” Stal, “Mr. I. Magination”, in Howard H. Prouty (Ed. ), Variety Television Reviews, Vol. 3, 27 April 1949, no pagination. Fredric Wertham in his report on children’s media also praised Mr. I. Magination. Fredric Wertham, Seduction of the Innocent (London: Museum Press, 1953), p. 369. Other educational anthologies for children that adapted myth include The Finder (1954-5) and The Adventures of Danny Dee (1954-5). Tino Balio, “Introduction to Part I”, Tino Balio (Ed. ), Hollywood in the Age of Television (Boston: Unwin Hyman, 1990), p. 23. John Belton, Widescreen Cinema (Cambridge, MA: Harvard University Press, 1992), pp. 70, 73. Sobchack, p. 297. Solomon, p. 13. Trau, “With its third season under the aegis of the Ford Foundation […]”, in Howard H. Prouty (Ed. ), Variety Television Reviews, Vol. 5, 1954-1956 (New York: Garland, 1989-1991), 6 April 1955, no pagination. De Mille’s remake of The Ten Commandments in 1956 was obviously after the Variety review. Solomon, pp. 117, 307. The trend had been started by Joseph E. Levine’s Hercules, made in Italy in 1957 but released in the U.S. in 1959. In the U.S., it is thought to have made up to $18 million dollars. Also known as Hercules and the Princess of Troy. Solomon, pp. 17, 123. Pit, “Hercules”, in Howard H. Prouty (Ed. ), Variety Television Reviews, Vol. 8, 1963-1965 (New York: Garland, 1989-1991), 15 September 1965, no pagination. The format was borrowed from the successful radio program that also featured Cronkite, originally broadcast in 1947 as CBS is There and continuing in 1948-50 as You Are There. Woolery, p. 567. Anchor Walter Cronkite went on to become CBS anchor for the evening news, moving from make-believe news anchor for children to the real news anchor for adults. As Maria Wyke notes, when Cronkite hosted the television series, he was “already famous as an anchor for CBS broadcasts of the political conventions” in 1952. Wyke, p. 69. The Iliad, in fact, concludes before the end of the war and makes no reference to the wooden horse. The story of Troy found its expression in different epics from different periods, often with varied details. It is generally accepted that some historical war probably formed the basis, however broadly, for the story. Richard Lattimore (translator), The Iliad of Homer (London: University of Chicago Press, 1951), pp. 18, 25-6. Variety, “You Are There”, in Howard H. Prouty (Ed. ), Variety Television Reviews, Vol. 5, 21 April 1954, no pagination. Fischer, p. 22. For example, in The Whistling Wizard (1951-2) mythological characters were encountered in the ‘Land of Beyond’, a realm of myth, legend and fairy-tale accessible through an enchanted well. Like Mr I. Magination, myths and legends were usually updated and were geared towards teaching a lesson or conveying educational information, but within an overall fantastic context. Woolery, pp. 557-8. George W. Woolery, Children’s Television: The First Thirty-Five Years, 1946-1981, Part I: Animated Cartoon Series (Metuchen, N.J.: The Scarecrow Press, 1983), p. 183. Including Captain Video and his Video Rangers (1949-55), Space Patrol (1950-5), Tom Corbett, Space Cadet (1950-5), Flash Gordon (1954), Rod Rocket (1963), Star Trek (1966-9) and The Time Tunnel (1966-7). On the adaptation of myth into science fiction programs, see Baker, pp. 64-9. Including Batman (1966-8), The Marvel Superheroes (1966), Birdman (1967-8) and The Adventures of Aquaman (1968-9). See Baker, pp. 70-4. Writing before the major wave of animated superheroes, Fredric Wertham commented that “[c]lassic books, mutilated in comic-book form, have been adapted to the television screen”. The heritage of the Wertham attack helps to explain why the mythological content of the later programs were rarely appreciated. Wertham, p. 381.